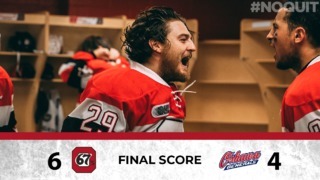 A late comeback by the Kingston Frontenacs spoiled the party at the Arena at TD Place, as the Ottawa 67’s dropped their second game in as many days, 5-4 in overtime. Ottawa held a 4-2 lead on the Frontenacs until late in the third period, before the visitors scored three late goals to take the two points in dramatic fashion. With the overtime point, Ottawa now sits three points back of the North Bay Battalion for sixth position in the OHL’s eastern conference. After losing 7-2 Friday night in Kingston, Ottawa knew they needed a strong start out of the gate. They were able to deliver, with Tye Felhaber getting Ottawa’s first goal at 14:19. That stood as the sole goal of the opening period. Kingston had an answer at 11:42 of the second, but four minutes later Quinn Yule handcuffed Jeremy Helvig with a low shot that beat him five hole and Ottawa had a 2-1 lead after 40 minutes. Travis Barron began the third period on a good note for the Barber Poles, scoring an insurance goal at the 15-second mark of the frame. However, the Frontenacs were opportunistic late in the game. With the score at 4-2, the visitors began a comeback. Kingston scored two goals in 17 seconds to tie the game, and an overtime tripping penalty to Tye Felhaber was the deciding factor in the contest. Jason Robertson scored the overtime game-winner on the power play. 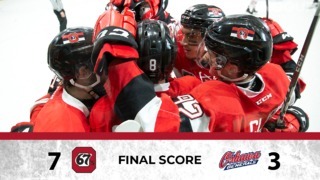 The 67’s will look to rebound tomorrow afternoon when they host the Mississauga Steelheads. The puck drops at 2 p.m. The line of Sasha Chmelevski, Travis Barron, and Tye Felhaber has 98 points in the 24 games since they were reunited. Quinn Yule’s two goals were the fifth and sixth of his OHL career – this was his first-career two-goal game. 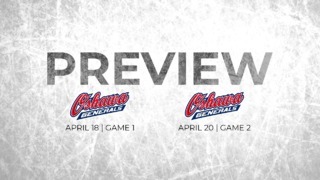 Ottawa’s season series against the Frontenacs is now over, finishing with a 2-4-2-0 record. A crowd of 4,286 took in the action at the Arena at TD Place, kicking off back-to-back home games with a lot of energy. The Frontenacs two goals came on three shots in the final minutes of the game.